In the Mahayana and Vajrayana traditions the Medicine Buddha Sangye Menla takes a special place in the hearts of devotees. Specializing in the curing of diseases, both physical and mental – of which confusion is the root cause – the Medicine Buddha is also the Buddha of wisdom. His healing acts are only prelude to Supreme Enlightenment for those who learns about his vows or merely hear his name. Medicine Buddha is helping to everyone who seeks to be reborn in the Sukhavati, the Pure Land of Buddha Amitabha. In East Asian temple Medicine Buddha is usually represented seated as part of the trinity with Shakyamuni (in the centre) and Amitabha (on right hand of Shakyamuni). His right hand is raised, forming the Varada mudra, the hand-and-fingers gesture symbolising offering, giving and compassion. The left hand usually rests on his lap, holding a jar of medicine (or sometimes a healing fruit or stupa). The medicine jar in dark blue colour of the gemstone Lapis Lazuli is the distinguishing feature of this Buddha. However in Tibetan or Vajrayana Buddhism Medicine Buddha is always depicted in a deep blue colour, holding a jar with the healing nectar at his navel in his left and with his right hand holding a healing herb in an open palm and touching the ground calling the earth to be his witness. 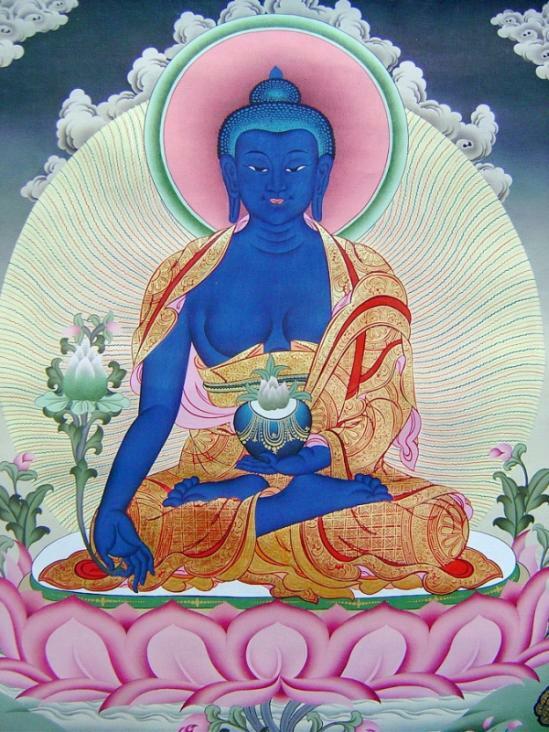 The most important text narrating about Medicine Buddha Sangye Menla is Bhaiṣajyaguruvaiḍūryaprabhārāja Sūtra or commonly known as the Medicine Buddha Sutra. The Sutra is composed of three parts. The first is describing the Twelve Great Vows of the Medicine Buddha, the second tells us about his extensive merits and many ways he comes to help to those, affected by sufferings and calamities. The third part describes the vows of the twelve Yaksa Generals to benefit sentient beings. The Sutra contains the teachings on rebirth into Pure Land of Buddha Amitabha and the practical part of reciting the Medicine Buddha mantra and dharani and describes the practical benefits of it in the daily life. The Sutra emphasizes trust in the assistance of Medicine Buddha but also stresses the importance of single-minded concentration and meditation. And when we think how exactly Medicine Buddha Sangye Menla can cure sicknesses and diseases, we should remember that all our karma is created by our wrong threefold activity: wrong actions, wrong language and wrong thinking/perception. All karma is created by the three poisons of the Mind: attachment, aversion and confusion. And when we meditate on Medicine Buddha or chant his mantra, we identify ourselves with the absolute Buddha-mind of Sangye Menla, the state which is liberated and absolutely free from all impurities and imperfections. External world is just a mirror of what is inside of our mind. If the mind is sick, the body becomes sick and the external world becomes troublesome. If we are loosening the tights of our bad habits and thinking patterns, by the help of Medicine Buddha by reminding the clear light of the mind and our previous healthy state, we are cutting off the roots of our sufferings; it cannot grow or deepen anymore there. It brings us a recovery. It is also important to note, that the sound and vibrations of the Medicine Buddha name and mantra can touch very deep levels of our consciousness and make this process a straight forward to us. That’s why in the sutra is said that who hears the name of the Medicine Buddha will not be reborn in the lower realms of the existence. Medicine Buddha will protect you from 4 types of ailments: disease, harm from spirits, negative karma and obstacles. I recommend to read completely the Medicine Buddha Sutra to learn more about benefits of this mantra and meditation!